Something that I’m being asked to talk about a lot lately is ‘culture of care’ (CoC). So what is it – and how can people set about ensuring that they have a good one? The first thing to say is that, in my opinion, CoC is a meaningless phrase unless defined. There is also no ‘one size fits all’ CoC to aspire to. Instead, each research organisation needs to consider what CoC means to them, their students and staff. Having defined CoC at a local level it then becomes something meaningful and its true value can be realised. CoC can be used to express the duty of care, responsibilities, expectations or ethical considerations placed upon researchers whose research involves living subjects. This may be human or animal subjects, or more broadly, research that has an impact upon the world, or the environment within which we live – and that we rely on to continuing living. CoC can also be used to describe the work ethic or research practices within a given research organisation. In this context, CoC is about how the research framework and management practices support its staff and students to do great research (i.e. is ethical, useful & reproducible), but also fulfil their potential to become the best researchers that they can. CoC is sometimes also viewed in a much broader, more holistic context, at which point it becomes more about the stewardship and preservation of scientific enterprise. This involves inspiring the next generation, providing role models for researchers, being open and honest about what research entails and maintaining a reputation of science as being responsible, trustworthy and for the greater good. Now that you have some idea of what CoC could encompass, we can to start thinking about how it can be translated into practice. 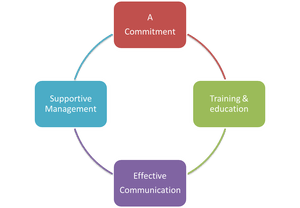 For me, there are four key foundation stones upon which a good CoC can be built: commitment, education & training, communication and management. Having defined what CoC means in an organisation and written it down, the process of taking collective responsibility for achieving it can begin. There needs to be widespread awareness of policies, procedures and expectations that, together with a system of education and training, support its fulfilment. Having education, training or mentoring opportunities available to support lifelong learning is a must. This helps every student or staff member to understand what CoC means for them at each stage of their career, what they are expected to contribute, why and how they will be supported to fulfil this expectation. Effective communication that reaches and is understood by all is essential to cut through the noise of day-to-day work pressures and challenges. Researchers are often fighting to keep up to date with published findings and protocols, so time is of a premium. It’s important therefore that organisations support (and even reward) students and staff to have an awareness of broader research integrity issues and responsible conduct practices in order to inform their own research conduct. This fits well with the ethos that organisations have a critical role in developing responsible researchers and supporting them to be the best that they can. Strong, supportive and positive leadership is essential if everyone is to share the sense of collective responsibility for achieving a good CoC. Managers must take responsibility for ensuring that appropriate standards of integrity, responsible conduct and behaviour are implemented. Good monitoring will help alert them to problems and identify potential issues early, so that assistance and support can be offered to those who need it. I really hope that you have enjoyed reading this blog. If you are looking for someone to give a talk, deliver some training or a consultant to undertake a project regarding your establishments ‘culture of care’ then please get in touch via my website www.responsibleresearchinpractice.co.uk as I would be very happy to help you if I can. The culture of scientific research in the UK (Dec 2014). The Nuffield Council of Bioethics conducted a series of engagement activities during 2014 to investigate the culture of scientific research in the UK and this is the report of the findings. The concordat to support research integrity (July 2012). This concordat contains five commitments that the signatory organisations believe everyone engaged in research should be able to agree with regardless of their field of research. The third commitment (pg15-16) is the most relevant to this blog, talking about embedding a culture of research integrity. Reproducibility and reliability of biomedical research: improving research practice (Oct 2015). This symposium report discusses the relationship between the culture and incentives embedded within the scientific community and research reproducibility (pg 52-54). Promoting a culture of care – pg 55-58 in the LASA/RSPCA Guiding Principles on good practice for Animal Welfare and Ethical Review Bodies (Sept 2015). This chapter talks from an AWERB perspective about how to go about defining the culture of care, the structural and behavioural elements that can be a feature of a culture of care and suggests activities that can help in developing an establishments’ culture. Identification and management of patterns of low-level concerns at licensed establishments (Dec 2015). This Animals in Science Regulations Unit advice note provides a definition of a good culture of care for establishments with licenced authority to use animals in research. Creating a culture of care (Aug 2014). This NC3Rs blog post discusses culture of care from the perspective of a contract research organisation.